It’s the new year and time to build better eating habits. I am planning to switch to eating paleo most of time ( I’m a desi girl at heart and giving up all carbs is gonna be unnatural). I don’t think carbs are the devil, but over time I have realized that certain carbs don’t agree with me, so eventually would like to add back chickenpeas and bajra. For now though, I am going to do a whole 30 challenge. I love to recreate old recipes, making them healthier. Knowing that you are actually feeding your body, rather than the feeling of hunger. That’s powerful, to nourish all of you. Back to whole 30. I love certain aspects of this plan, the emphasis on cooking, using healthy ingrediants, getting rid of sugar and processed foods, and breaking the cycle of your weaknesses. 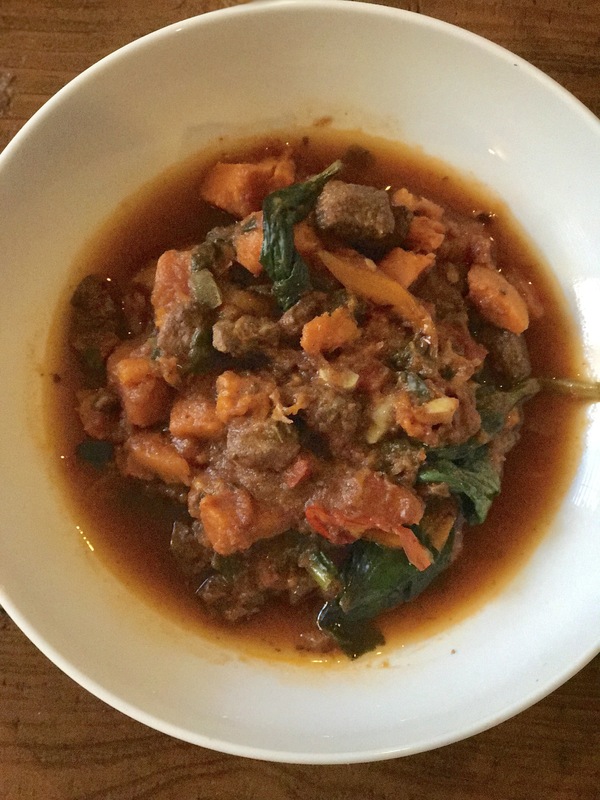 This sweet potato and chicken stew is insanely good. It’s hearty and the kind of food that warms up your soul. And it’s made in your insta pot. Yes! 1/2 a bellpepper cut up in thin strips. Heat one tablespoon of olive oil and sauté garlic and onion till its translucent. I do this on the sauté mode of the insta pot. Add chicken and cook till its opaque. Add your spices and sauté till fragrant. Add the bay leaf, tomatoes, sweet potato and chicken broth. Switch over to slow cook mode on the instapot and let this deliciousness cook for 2 hours. Now add the bell peppers and spinach and cook for another 2 hours. It smells divine! The warmth of the garam masala and cumin is so comforting in the winter. My not so new instant pot has been working hard for me lately. I love the convenience of having a slow cooker, pressure cooker, steamer all in one handy electric pot. It adapts especially well to desi cooking. I steamed the eggplant in the instant pot and finished the curry on the stovetop, though you could easily make it in the instant pot. 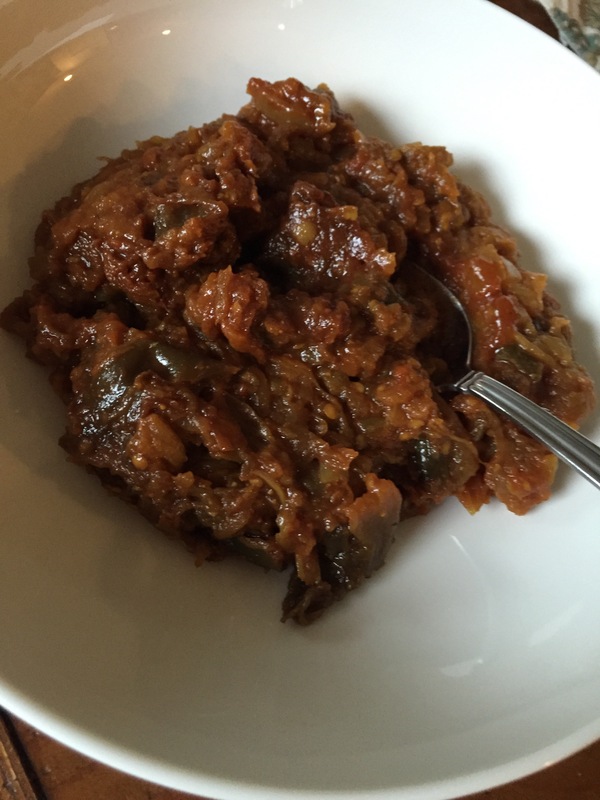 Cut the eggplant into quarters and steam in the instant pot (I added a cup of water and used the steamer insert). While the eggplant is steaming, heat a little oil in a saucepan, add finely diced onions and sauté till translucent. Add the ginger garlic paste and cook for a few minutes being careful not to burn the ingredients. Add salt along with turmeric, coriander and cumin powders and cayenne if you are using it. Once fragrant, add the tomato purée and stir, let it cook on a low medium heat till you see the oil separate. Once the eggplant is done, Mush the eggplant lightly with a fork and add to the saucepan. Combine the eggplant well with the masala and cover the saucepan with a lid. Let it simmer in its juices for 10-12 minutes on low heat. Garnish with coriander leaves. It’s definitely soulful food kinda weather here in the PNW. While some shrimp and grits, chicken pot pie or a steaming bowl of kitchri would be amazing, I am making healthier choices. This recipe was made mostly because I had leftover chicken, lots of kale and some carrots. 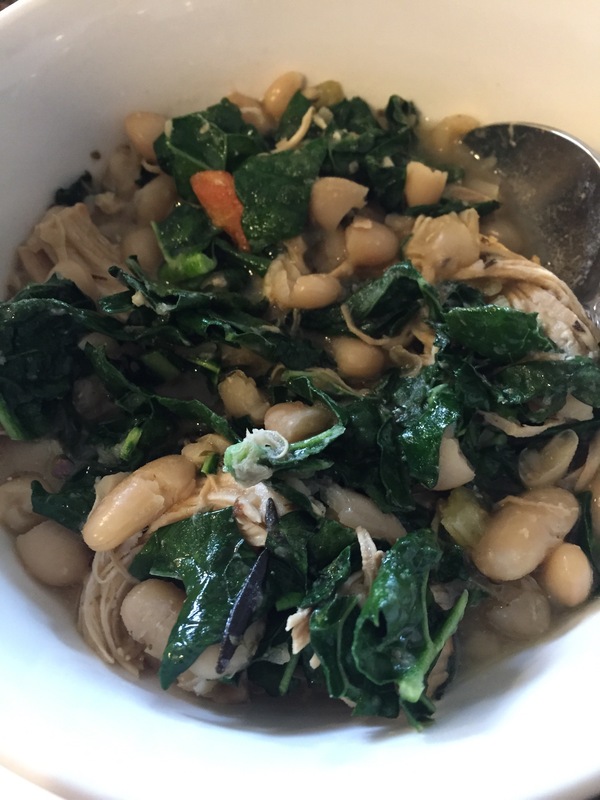 Cannellini beans have a delicious creamy texture and that’s definitely makes this soup feel in the words of my 2 year old – “comfy cozy”. Heat oil in the insta pot (manual) or on the stove top. Sauté onion, celery and garlic. Add the carrots and cook. Next add the thyme, chicken, beans and the chicken stock, salt and slow cook for 2 hours or on the stove top on low medium for 30 minutes. Once it’s cooked through and the house smells delicious, add the kale and let it cook for another 5-10 minutes. I don’t like the kale to get too soggy. Enjoying this beautiful life with my love, our daughter’s and puppies! cookies in the oven, a pot simmering on the stove and there is even more magic.